Conceived of by longtime Colombia artisan Blue Sky (nee Warren Edward Johnson), the chain joins other permanent works by the artist such as the large tromp l'oeil known as Tunnelvision, and what may be the world's largest fire hydrant, Busted Plug Plaza. 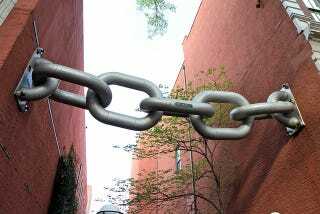 While the massive links of the chain look far too large to be real, they are in fact made of steel that the artist had professionally welded together in the interest of safety since the span hangs ten feet over an open public alley. The installation was hefty enough that it required 2,000 pounds of hydraulic pressure to complete the final link. Despite the massive undertaking, Blue Sky actually installed the piece on the sly without consulting the city. While he had the approval of both the owners of the linked historic buildings, the piece actually hung over city property. After hanging the chain one Sunday night to little fanfare, the popularity of the rogue piece of art caught on. However unlike many unauthorized expressions of art, the Neverbust Chain was almost instantly approved by the city who not only liked the work but also knew the value of another piece from the acclaimed artist. When asked why he decided to hang the chain, Blue Sky simply responded that, "One building looked like it was leaning a little bit." So whether there is a vague statement or just a whimsical sentiment behind the giant chain, its reputation and appeal remain untarnished.